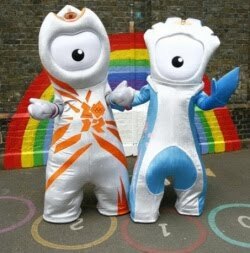 Yesterday morning, Andrew announces that London just revealed their Olympic mascots for the 2012 Games and that they’re a bit strange. Ok. Really strange. Wenlock and Mandeville look like an odd combination of the one-eyed alien chick from Fox’s show Futurama, and those ultra creepy Teletubbies. Judging by a poll just released today, it appears half of marketers agree, they’re creepy. A poll of 817 marketers by marketing recruitment specialist EMR, has found that just over half (51%) had a negative response to the mascots. Research also found that 22% labelled the design ‘dreadful’ (don’t you just love the Brits sense of the dramatic?!!) and 12% said it was very poor while 16% said it was ‘very good’ and 8% rated it as ‘excellent’. Despite the ‘dreadful’ and ‘very poor’ ratings, 30% of marketers did admit they preferred the characters to the Olympic logo. To the London OC’s credit, Wenlock and Mandeville were named in honour of Britain’s Olympic heritage, and one could accuse them of going for the cute and conventional route. (This might actually be their marketing angle). True, but what’s with the one eye thing? Wouldn’t that scare the little ones? Then again, perhaps not. Kids don’t seem to be at all creeped out by the Teletubbies or clowns. Grownups on the other hand, run screaming. In any case, the short animation film they’ve put together to introduce the mascots actually makes them look cute. Perhaps there’s still hope for London’s marketing plan. If I could make a suggestion: keep the mascots to animation only; a stadium of toddlers in tears is never a pretty sight.